Meanwhile, shelling near the rebel-held eastern suburbs of Damascus killed dozens of people over the past 24 hours as President Bashar Assad's government, supported by the Russian military, pushed its assault on the capital's rebel-held suburbs. International aid workers on a rare humanitarian mission inside the besieged area described dramatic scenes of rescuers trying to pull corpses from the rubble of buildings and children who hadn't seen daylight in 15 days. U.N. Secretary-General Antonio Guterres urged all parties to implement a cease-fire demanded by the Security Council on Feb. 24 and allow "safe and unimpeded access" for convoys to deliver aid to hundreds of thousands of Syrians in desperate need. Guterres descried that attacks on eastern Ghouta reportedly killed more than 100 people Monday and that 14 of 46 trucks in a convoy trying to deliver supplies to Douma in eastern Ghouta weren't able to fully unload, U.N. spokesman Stephane Dujarric said. "People were telling us very desperate stories. They are tired, they are angry. They don't want aid, what they want is the shelling to stop," Pawel Krzysiek, head of communications for the Syrian branch of the International Committee of the Red Cross, said Tuesday. "No child should be witnessing this in their very early state of development. But the children of Douma and the children of eastern Ghouta unfortunately do, and that's what makes the situation very, very dramatic," he said. Monday's aid shipment was the first to enter eastern Ghouta amid weeks of a crippling siege and a government assault that has killed some 800 civilians since Feb. 18. 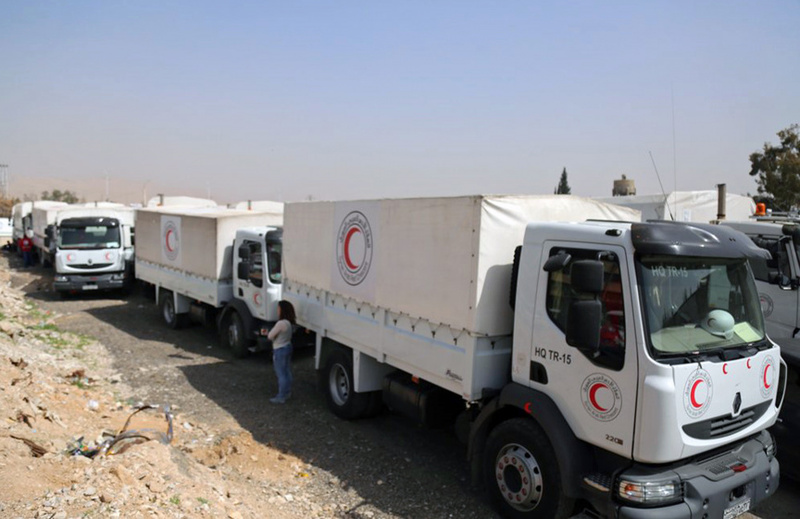 Aid agencies said Syrian authorities removed basic health supplies, including trauma and surgical kits and insulin, from the convoys before they set off. "After nearly nine hours inside, the decision was made to leave for security reasons and to avoid jeopardizing the safety of humanitarian teams on the ground," said Jens Laerke, deputy spokesperson for the U.N.'s Office for the Coordination of Humanitarian Affairs. As a result, 14 of the 46 trucks in the convoy were not able to fully offload critical humanitarian supplies. Laerke said the team found a desperate situation for people who have endured months without access to humanitarian aid. "Food for civilians was in short supply or prohibitively expensive and high rates of acute malnutrition were observed," he said. Krzysiek said there was "no electricity so it was extremely dark and we had to go. But we left with heavy hearts because we knew that we are leaving people behind, we know what they will be going through." Airstrikes continued Tuesday. The opposition's Syrian Civil Defense search-and-rescue group reported at least nine people were killed in airstrikes on the town of Jisreen. The group, also known as the White Helmets, said two of its volunteers, and 28 others, suffered difficulties breathing following shelling on the town of Hammouriyeh on Monday evening. It accused the government of using "poison gas." The Observatory reported 18 people suffered breathing difficulties, without attributing a cause. Waiel Olwan, spokesman for one of the main rebel groups in eastern Ghouta, said the offer was part of Russia's "psychological warfare." He denied reports that rebels were negotiating an exit, adding that the fighters will continue to defend themselves as long as they are under attack. The Russian Defense Ministry said Tuesday's crash of the An-26 military cargo plane occurred just 500 meters (1,600 feet) from the runway of Syria's Hemeimeem military base. It said the plane did not come under fire, adding it would conduct a full investigation.